These temperature transmitters are designed for universal use in plant and machine building, and also in the process industry. They offer high accuracy and excellent protection against electromagnetic influences (EMI). Via the WIKAsoft-TT configuration software and the model PU-548 programming unit, the model T15 temperature transmitters can be parameterised very easily, quickly and with a clear overview. Besides the selection of the sensor type and the measuring range, the software enables the error signalling operation, damping, several measuring point descriptions and process adjustment to be stored. 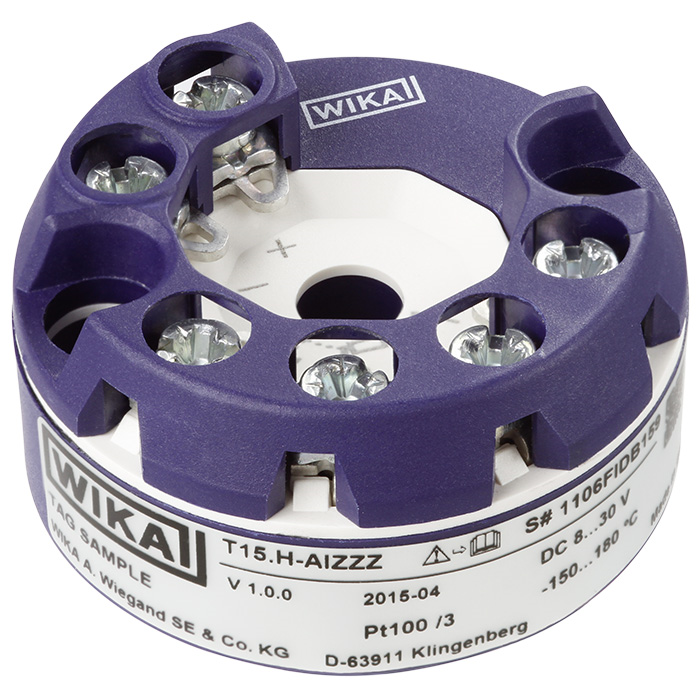 Furthermore, the WIKAsoft-TT software offers a line recording functionality where the temperature profile for the sensor connected to the temperature transmitter T15 can be displayed. The temperature transmitter model T15 also has diverse supervisory functionality, such as the monitoring of the sensor wire resistance and sensor-break detection in accordance with NAMUR NE89 as well as monitoring of the measuring range. Moreover, these temperature transmitters have comprehensive cyclic self-monitoring functionality.